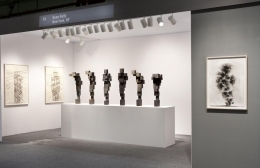 Sean Kelly is pleased to present a solo exhibition of six sculptures and related drawings by the preeminent British artist Antony Gormley at the ADAA Art Show (Booth A1). The work is from Gormley's ongoing SMALL BLOCKWORKS series, which the artist began in 2013. The SMALL BLOCKWORKS are models for the 1.5 life-size BLOCKWORKS, which use the smallest number of compressed iron blocks to evoke a human form. 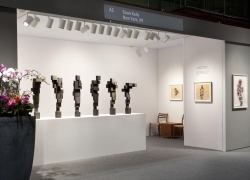 These blocks either sit one on top of the other or side-by-side, whether the figure is standing or crouching, using space and mass to represent and define the body. 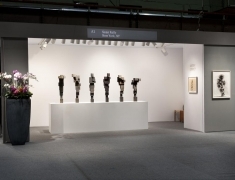 The Art Show will be held at the Park Avenue Armory at 67th Street from March 4 - 8; for more information on the fair, including opening hours, directions and ticketing information, please visit artdealers.org. 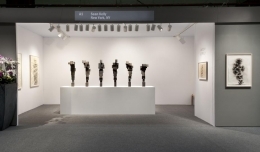 The gallery will concurrently participate in The Armory Show at Pier 94 (Booth 501) in New York; for more information, please visit thearmoryshow.com. Throughout the course of the fairs, the gallery will be open to the public during regular hours—from 11am until 6pm, Tuesday to Friday and from 10am until 6pm on Saturday—with the exhibitions Alec Soth: Songbook and Hugo McCloud: Palindrome, on view through March 14.